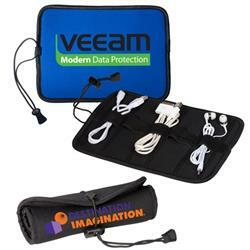 The Neoprene Roll up storage case with your custom logo for cords and earbuds. One of the most frustrating things to happen is losing your charging cords for your devices. With this Neoprene Roll-Up Tech Case that solves the problem. Compact and portable it allows you to store up to 5 different cords, batteries or even personal items. It is held closed with a handy elastic cord with adjustable lock. Fully customizable with your logo or design it will make a great tradeshow givaway. A new and soon to be best selling tech case organizer! Production Times Available: 5- 7 working days standard. FREE 3 DAY RUSH AVAILABLE. 5.5mm neoprene case, Features five slots with elastic straps, Elastic cord closure with adjustable lock, Packaging is in bulk. Travel case for USB cords and more.